I find it amazing what you can do with butter, eggs, flour and milk – one minute I am baking a cake and cookies, in the mornings it’s pancakes and then next a batch of scones or eclairs. The magic of the kitchen where a slightly different technique turns out something completely different never ceases to amaze me. Take these golden cheese puffs – classic gougères from Burgundy, France – nothing much more than milk, butter, eggs and flour, oh and good cheese. 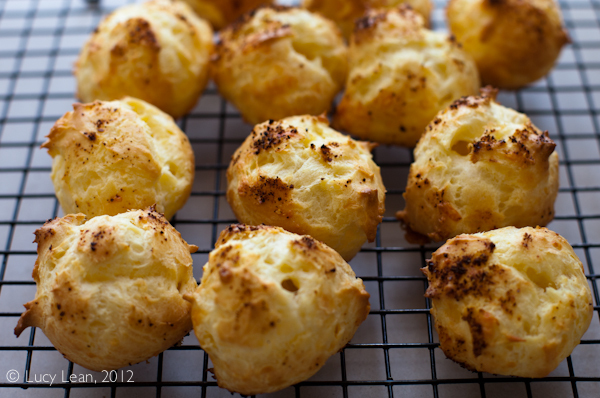 I like to bring a batch of gougères to a party if I’m asked for nibbles – these were perfect for the swimming party we went to for Memorial Day. The kids would get out of the pool dripping wet and ravenous – the piglet on the spit not quite cooked – and set about these balls of air filled cheesey deliciousness. They will be great for father’s day this coming Sunday when we are planning a picnic at the beach. Pâte à choux is a quick and easy pastry to make starting on the stove and then nothing more than a lot of beating – I like to use my KitchenAid mixer. Fill them with cream and top with chocolate for eclairs or profiteroles or opt for a savory cheesy version like these gougères for the perfect pairing with wine – or my glass of choice, Champagne. For this recipe make sure you practice perfect mise en place; the recipe comes together quickly and easily but you do need to have everything ready so you don’t have to stop mid-way through to measure something out. The dough must be spooned out onto the baking sheets immediately and baked or frozen (useful if you are one of these people who likes to have something ‘ready’ in the freezer should someone stop by unexpectedly). I have added espelette pepper to Dorie Greenspan’s recipe – it gives the cheese a nice peppery lift, if you don’t have espelette you could substitute cayenne pepper. 6 oz (about 1 1/2 cups) coarsely grated cheese, plus extra for topping – I used Kerrygold Reserve Cheddar for the sharp strong flavor, Gruyère is also a favorite. 1. Pre-heat the oven to 425 F and line 2 baking sheets with parchment paper. 2. In a medium saucepan bring the milk, water, butter, salt and espelette pepper to a rapid boil over high heat. 3. Add the flour, lower the heat to medium and stir really well with a wooden spoon. The dough will come together in the bottom of the pan, continue to stir vigorously for another couple of minutes to dry the dough a little and so it becomes nice and smooth. 4. Put the dough in the bowl of the electric mixer with the paddle attachment and let it rest for about a minute. This lets the dough cool a little before adding the eggs. 5. Turn on the mixer on medium speed and add the eggs one at a time, making sure each one is fully incorporated before adding the next. Beat the mixture until all the eggs have been added and the dough is thick and shiny. Mix in the 6oz of cheese and immediately make the dough into cheese balls using two spoons, by dropping about 1 tablespoon of dough for each ball onto the parchment paper. 6. 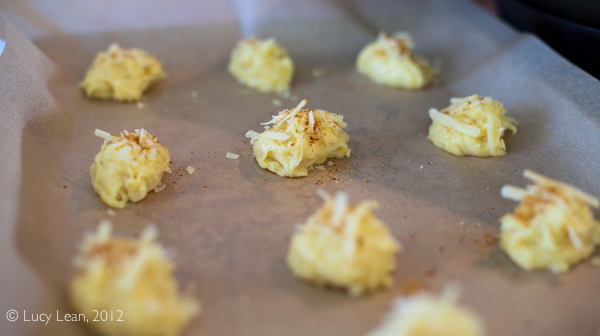 Top each ball with a little cheese and a dusting of espelette and place baking sheets in the oven, turning the temperature down to 375 F. After 10 minutes rotate the baking sheets and cook for another 12 – 15 minutes until the gougères are puffed up, golden and firm to the touch. Transfer to a wire rack and cool. Best eaten warm straight from the oven! « Happy Hedgehog Birthday Elsie! So true about those staple ingredients! I never looked at it in that way. Thanks for sharing this recipe. I am a huge fan of Kerrygold! I too love the thrill of baking ~ watching the same ingredients transform into all kinds of things simply based on ratios. 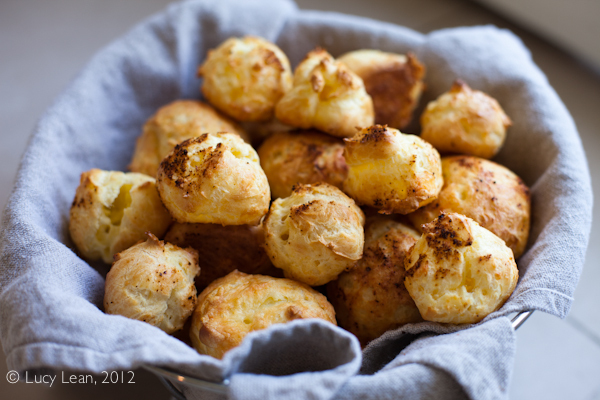 Cheese in the dough + topped with a little more, these gougeres look amazing! These are so fun! They look tasty too – wish I could hop a flight to France, but I will settle with your recipe! this could very well be party of my 5th food group. these are one of my guilty pleasures and if I could pop my hand right into that bowl, I would!